Nancy, Andrea and I capped our Saturday evening by joining Heike to watch the European Cup Championship between Dortmund and Bayern Muenchen. Bayern won a close and well played match 2-1. There were also many other activities going on this weekend in Leon. Many children were celebrating their first Communion. There were many young Spanish girls wearing their communion dresses with the families and friends. After the football match we walked to 11th Century San Isidoro Basilica Church where they had a wonderful show in which the history of Leon was illuminated on the church walls stirring music in the background. We all had a very good time. 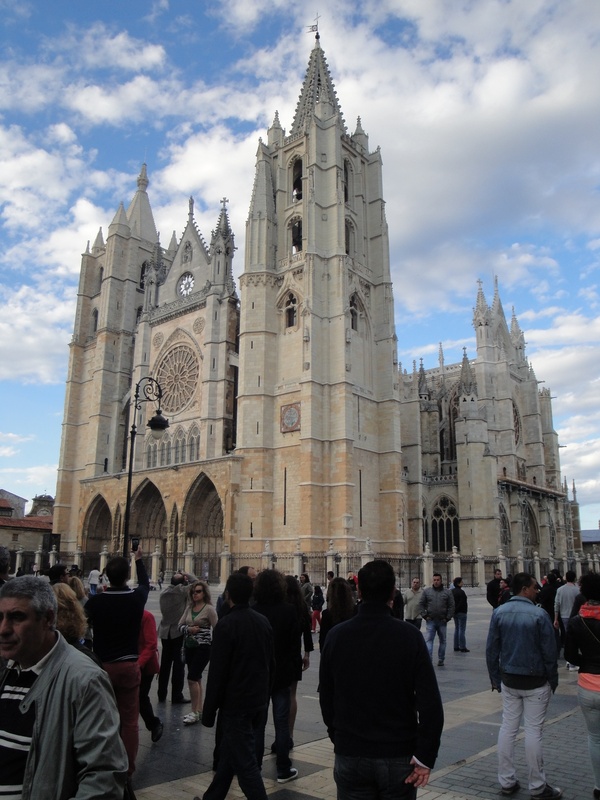 Nancy, Andrea and I started our Sunday in Leon by going to Mass at one of the chapels adjoining the magnificent 13th Century Gothic Cathedral Pulchra Leonina in the Plaza Regal. Of course, the Mass was in Spanish but the liturgy is the same regardless of the language. We were able to worship in a church today that is older than any found in the USA. At the Plaza we saw other fellow pilgrims that we’ve been running into the last week. We took a picture of our small group of camino friends in which the UK, Japan, Italy, India, Basque, Germany and the US are represented. Typical gathering for the Camino! This evening was a quite gathering in which we stopped for a beer in an Irish Pub in the Plaza Mayor then had Pizza and Chianti at an Italian Restaurant near the Cathedral. Helene from Switzerland, Renate and Heike from Germany, Britta from Denmark and Joe, Nancy and Andrea from Colorado made up the group. Tomorrow we’re back on the Camino with Hospital de Orbigo our goal. We really needed this weekend in Leon to recuperate as we have many more kilometers in front of us. I hope to make another blog tomorrow. Buen Camino! The magnificent cathedral in Leon. 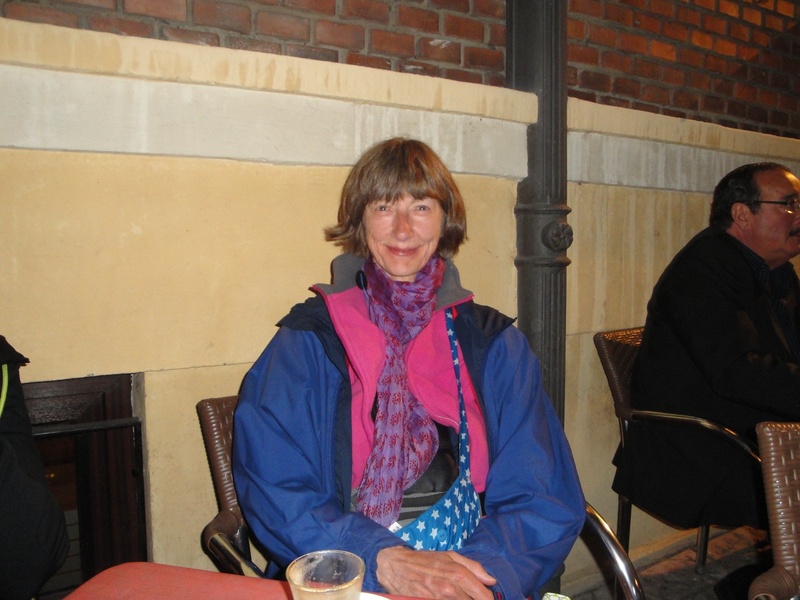 Britta from Denmark walking her 3rd Camino! Camino friends continuing to meet along the way. Glad to hear of the recovery and recuperation. May your walk today, and your minds and bodies, be full of renewed energy. 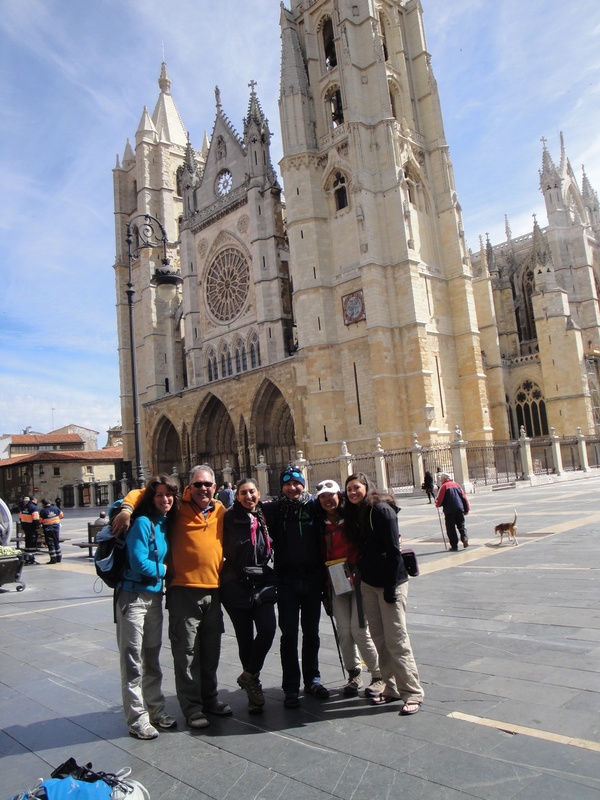 So glad you all had time in Leon for a rest and hope it reinvigorates you. Also hope the “head,shoulders,knees and toes(to quote a fav kids song) are doing well 🙂 Wishing you God speed as you continue your travels.